Broken dentures managed in Kingston, London 7 days a week 9am-10pm. Everyday tasks can become hard work for individuals who have cracked or broken dentures. Eating, swallowing and chewing can be increasingly difficult. Also there is the problem of the social embarrassment of having missing teeth. Therefore it is important that a broken denture be repaired as quickly as possibly. What to do if a denture breaks? In instances when the appliance breaks completely patients are advised to seek prompt assistance from our same day denture repair service. At Pearl dental clinic, we have a denture technician on-site, in many cases we provide a same-day denture repair or same-day denture remake service. This service is available 365 days a year, from 9am-10pm. Is the denture repair process difficult? The repair process depends entirely on how much damage has occurred. Cracked dentures are fairly easy to fix. Although severely fractured dentures can be more problematic and patients may need a replacement denture. 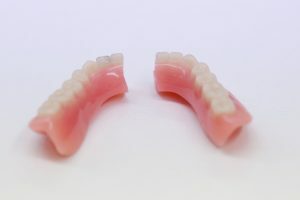 However, although it is not impossible to resolve issues with broken dentures, it can be significantly harder if a patient fails to keep all the pieces. Therefore, individuals are advised to ensure they have collected as many pieces of their denture as possible before coming to Pearl dental clinic. It is advisable to clean dentures over a bowl of water or use a folded towel that will soften the blow if the fragile products are dropped. Brushing the fixtures before soaking them will help to remove any food that has become caught in between the teeth. Also, denture cleaner will assist in the removal of stains as well as making them feel fresher in the mouth. Dentures should ideally be removed and cleaned after every meal. Pearl Dental Clinic is open 7 days a week from 9am to 10pm. You can book a denture repair appointment by calling us on 0208 547 9997 or emailing us or book an appointment online (24 hours).